Annotation: The Orphan Train saga begins in 1856 in New York City where Mrs. Kelly, a young widow, realizes that she cannot give her six children the life they deserve. Mrs. Kelly makes the ultimate sacrifice of love and sends them west on the orphan train to fred better lives with new families. The children, especially thirteen-year-old Frances Mary, feel an overwhelming sense of betrayal and abandonment. Their arrival in St. Joseph, Missouri, separates the children not only from their mother, but from each other as well. One by one they are adopted by western families -- some looking for children to love, others only seeking cheap labor. Frances has promised Ma that she will look after Petey, her youngest brother, no matter what. When she masquerades as a boy, "Frankie's" adventures eventually involve her in the activities of the Underground Railroad. Will honoring Ma's request help Frances understand that splitting up the family was really her mother's act of love? - Foster home care; Fiction. - Brothers and sisters; Fiction. The Orphan Train saga begins in 1856 in New York City where Mrs. Kelly, a young widow, realizes that she cannot give her six children the life they deserve. Mrs. Kelly makes the ultimate sacrifice of love and sends them west on the orphan train to fred better lives with new families. The children, especially thirteen-year-old Frances Mary, feel an overwhelming sense of betrayal and abandonment. 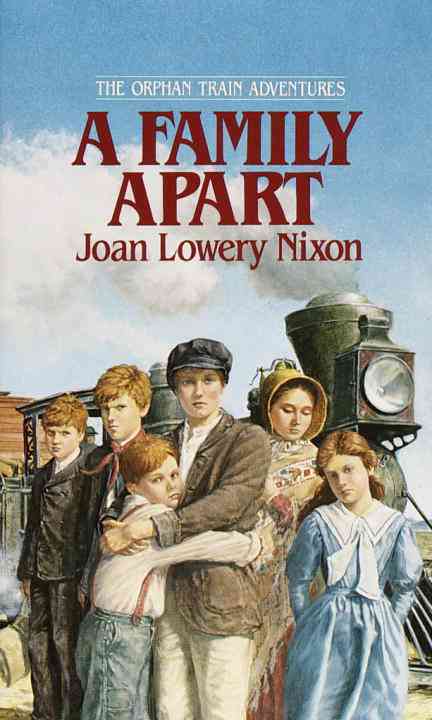 Contributor Bio(s): Joan Lowery Nixon was the author of more than 130 books for young readers and was the only four-time winner of the Edgar Allan Poe Best Young Adult Mystery Award. She received the award for The Kidnapping of Christina Lattimore, The Séance, The Name of the Game Was Murder, and The Other Side of the Dark, which also won the California Young Reader Medal. Her historical fiction included the award-winning series The Orphan Train Adventures, Orphan Train Children, and Colonial Williamsburg: Young Americans. This first book of the Orphan Train Quartet tells the story of Frances Mary, 13, eldest of the six Kelly children. Life in New York's grim 19th century slums consists of hardship for the poor but honest Kelly clan. When widowed Mrs. Kelly feels that she is no longer capable of providing for her children, she sends them west on the Orphan Train, to be adopted by farm families. Frances masquerades as a boy in order to be adopted with Petey, the brother she promised her mother she would protect. The practical difficulties Frances faces in maintaining this disguise are handled in an amusing and thoughtful manner. Since Frances and Petey are adopted by a couple with strong abolitionist sympathies, it should come as no surprise that Frances, just days after her arrival on the farm, finds herself helping two runaway slaves on the Underground Railroad. Though the plot is predictable and sometimes overly sentimental, and the Kelly family lapses into stilted Irish syntax, the rapid succession of high-spirited adventures make for lively reading. Ages 10-up. (October) Copyright 1987 Cahners Business Information. Gr 5-8 First of a projected quartet of orphan stories, each about a member of the same family of children transported by orphan train from New York to St. Joseph, Missouri, and surrounding areas. A kind of period piece, circa 1860, A Family Apart has a distinct Horatio Alger tone. Well constructed incidents, including the widowed mother giving up her children so they can be sent west to find a better life, a grass fire set by sparks from the train, and a holdup of the train contribute to fast action and considerable suspenseparticularly about the oldest girl, Frances, who disguises herself as a boy so she can better help her brothers and sisters. An Orphan for Nebraska (Atheneum, 1979) by Charlene Joy Talbot is a similar orphan train story, but about one boy. Patricia Beatty's That's One Ornery Orphan (Morrow, 1980) is more humorous but less of a saga. What happened to orphans and street children of the last century may well appeal to many of today's children who hear so much about street children and abducted and deserted kids. George Gleason, Department of English, Southwest Missouri State University, Springfield Copyright 1987 Cahners Business Information.